Two Russian photographers have been named among the winners of the annual World Press Photo, the world’s most prestigious competition for press photographers. 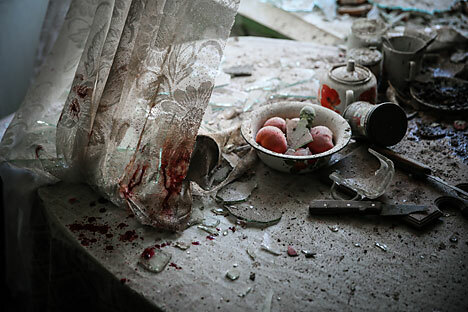 Russian photographer Sergei Ilnitsky won first prize in the General News category for single pictures for his photograph titled "Kitchen Table," taken in Donetsk, Ukraine in late summer 2014, while compatriot Sergei Ponomarev’s series of pictures of the Gaza conflict, published by The New York Times, earned him third place in the General News category for stories. Ukrainian-born Ilnitsky, a staff photographer for the European Pressphoto Agency (EPA) in Moscow since 2003, also won second prize in the Sports category with the photograph “Conquering Speed.” The photo depicts Marinus Kraus of Germany in action during the qualifying round of the HS134 FIS Ski Jumping World Cup in Nizhny Tagil, Russia, in December 2014. "An award like this is certainly pleasant, every photographer dreams of receiving it,” Ilnitsky said in comments made by phone to RBTH, “but a victory in the World Press Photo is still a set of accidents, the subjective choice of the jury. The prize is important for independent photographers, but for the EPA, where I work, it’s an ordinary thing." Moscow-born Sergei Ponomarev was a staff photographer at The Associated Press from from 2003 till 2012, but is now a freelancer and is currently photographing the conflict in eastern Ukraine. “I'm sitting in the middle of a cemetery with graves of unnamed soldiers fallen in the most stupid war and receiving congratulations on award for images of another stupid war. Lord, please....” Ponomarev wrote on his Facebook wall on hearing of his World Press Photo award. The World Press Photo of the Year award was given to Danish photographer Mads Nissen for a photograph of a gay couple in St. Petersburg. In comments made to RBTH, Director of the Moscow Multimedia Art Museum Olga Sviblova described the World Press Photo competition as “the most respected in photojournalism” and lamented a sharp decline in global interest in the genre. “As print media are in crisis now, photo reports are commissioned less and less,” Sviblova told RBTH.